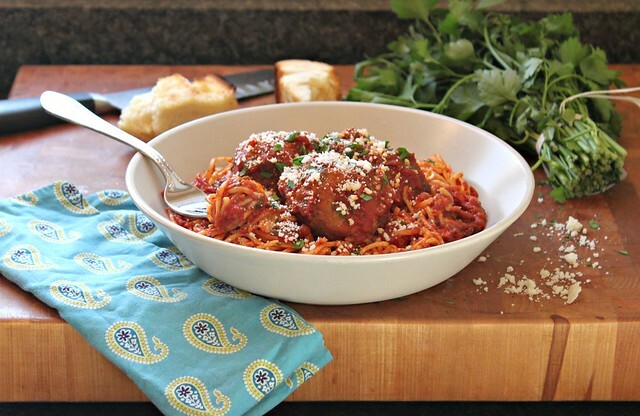 When I came across this Spaghetti and Meatball recipe posted on Saveur's facebook page yesterday, I literally dropped what I was doing and ran to the store! It was exactly the type of dinner I was in the mood for...something hot, something comforting and something the whole family surely would love! ~ I only added 1 egg to my meatball mixture by mistake (instead of the 3 the recipe calls for). These meatballs were SO delicious, I'm not sure I would add the 3 next time..one worked perfectly! ~ I added the sugar but not sure it was necessary ...think I might halve it next time but it's personal preference - either way TOTALLY AMAZING! ~ Just be sure NOT to rinse your pasta after you drain it...rather place the hot spaghetti in a bowl and immediately spoon a bit of your delicious sauce over the top and lightly toss with kitchen tongs. This will coat the pasta and allow some of the sauce's flavor to seep right into the spaghetti! Click below to go to the recipe and MAKE THIS TONIGHT!!! That definitely looks like a perfect evening! 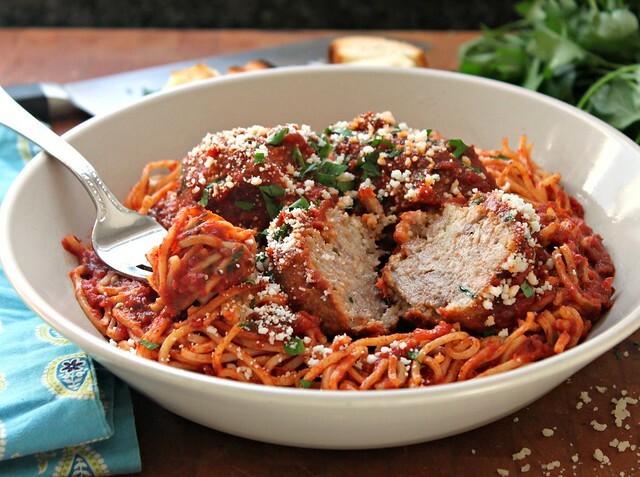 I'm craving comforting and hearty dishes right now...there may be pasta in my future. 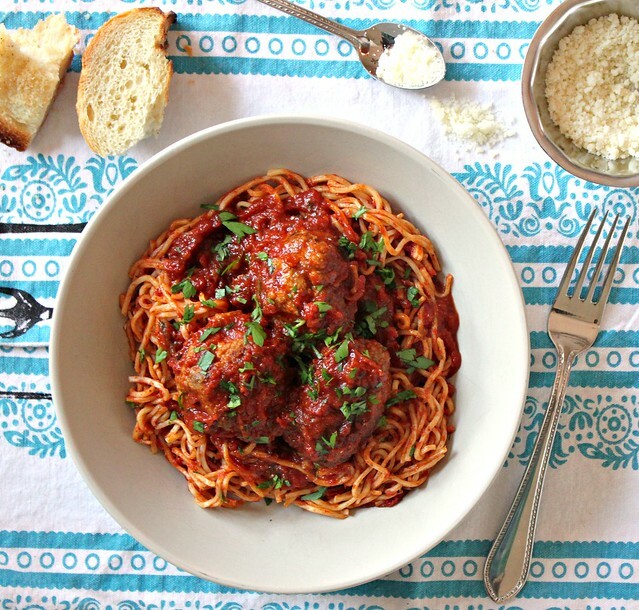 In my book.. there is truly nothing better then the classic spaghetti and meatballs!! It was such a staple when I was growing up. Yours looks soooooooo good!!! 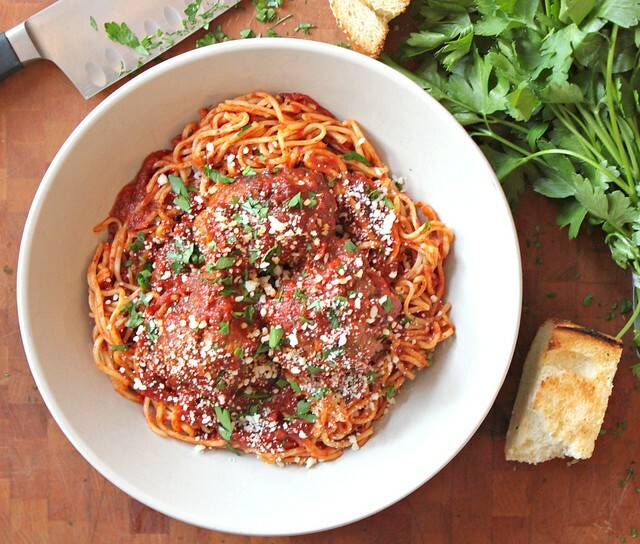 Your bowl of spaghetti looks mouthwatering. Now for a question: do people really rinse spaghetti? Seriously? Why? Here in Italy you actually often save some of the cooking water to ladle in with sauces to make them creamier (pesto is the perfect example). And you would want your pasta to be piping hot, no? 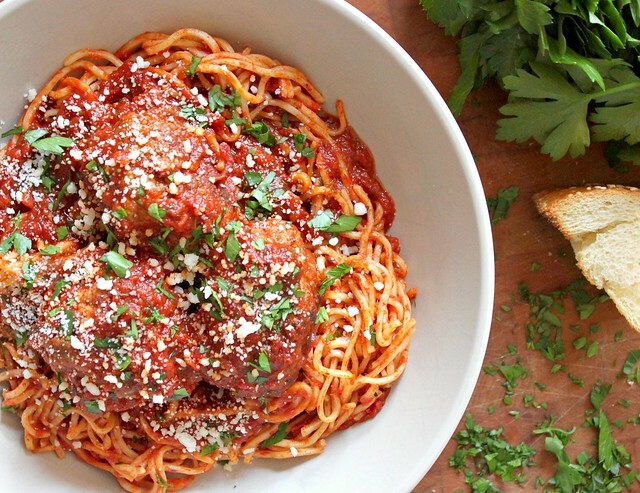 Spaghetti and Meatballs are one of my favorite meals. And when you take the time to do it "right" with the long simmer, the right cheeses and the quality meats it divine. As always, great photos. I am so craving for a big bowl of this right now! wow!! That looks like a very big, very tasty bowl of pasta! ovely photos by the way. We all try to cook fancy, new and innovative dishes, but sometimes it is so nice to return to a well known, all time classic comfort food such as this one! It just makes you feel right! can i come be your photo apprentice?? you're too good. This is definitely comfort food to me! Looks perfect and delicious. :) Wish you and your loved one a Happy Holiday. 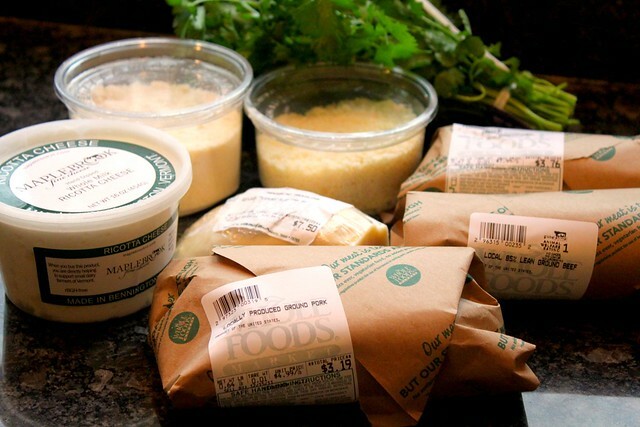 There's nothing better than a perfected classic recipe except maybe the sound and feeling of the Whole Foods packaging. Why am I looking at your blog at 11:30 when I've already had dinner? I'm getting hungry now!! Hope you and your family are having a great holiday season!